Our Cattery is located in Emmaboda, Sweden. 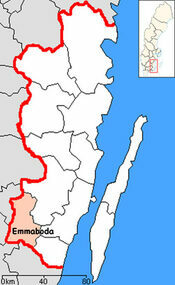 Emmaboda is located in southern Sweden in the Kalmar region. We are approximately 3 hours outside of Göteborg and 30 minutes from the Kalmar airport. Emmaboda is a small town or a village you might say. It's very lovely with lots of trees and lakes. I am a Swedish registered Diplomerad of Sverak since 2015, a member of FIFe and of Uppsala Cat Club. I received my Stamlava - SE*Ullrtass's in 2014 through Sverak in Sweden. I am originally from the United States and moved to Sweden in 2012 after I met my husband who was visting America. My husband and I decided to settle in this lovely country far away from the noise and distraction of the city life into the quieter surroundings that Emmoboda has afforded us. We can dedicate our lives to raising our cats and tending our organic garden while still having day to day jobs. 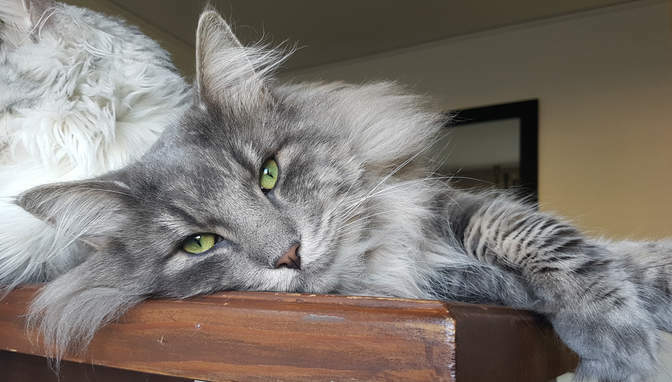 My journey with Norwegian Forest cats began when I bought my first Norsk Skogkatt in Sweden in 2013 after missing a my dearly beloved cat named Apollo who was my faithful companion for over 20 years in the United States. I wanted the same type of cat as he was, which was fluffy, huge, social...kind of like a dog but in cat form...but I wasn't sure what THAT was. Apollo, my very big and wild tom cat looked very much like a norwegian forest cat and climbed down trees paws first. He lived to be almost 23 years old but I had to say goodbye to him before I left for Sweden as he was very old and couldnt make the trip over because of his age. 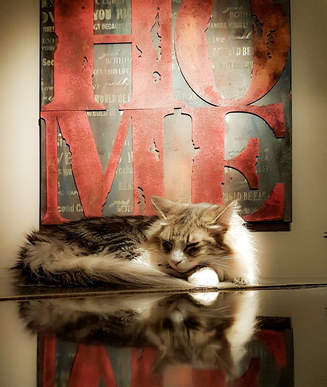 When I was finally at the place where I could think about another cat coming into my life I fell in love with a Little norwegian Forest Cat we saw and I had to have her. You understand how that is! This is how my journey began with my love and obsession with Norwegian Forest Cats. We now own seven lovely, wonderful creatures who delight and fascinate me to no end. 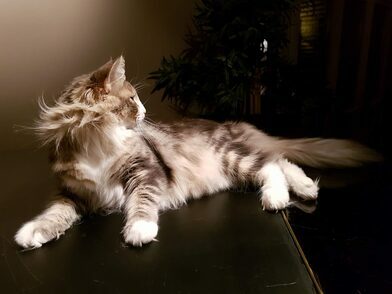 It has always been my goal to breed The Norwegian Forest Cat as close to its natural wild look from the first time I saw this breed of cat. 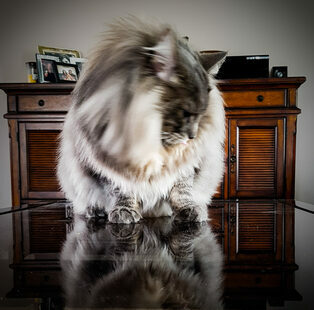 I was mezmorized by these big, beautiful and magestic kitties! I became interested in breeding them. Norwegians are known for having a good socialized temperment. This is one of things I love most about being near this breed. Because it remains and always will be my love of a wild and rugged looking type Norwegian, I seek to further these type of cats in future generations through my breeding program. This is what excites me and motivates. Each cat in our cattery is pedigreed in Sweden through Sverak within FIFe. We test each cat genetically for GSDIV, for PKDef, FIV/FeLV with a verified microchip by the veternarian and scan our cats' heart (HCM) and kidney (PKdef) at years 1, 3, 5, and 8. This is vital to remaining a healthy cattery. A complete health history including the full ancestry of each cat (as far as we have been able to research it) is given to each person who adopts a kitten from us. At any time a buyer needs help from us we are there for them. We relate to our kitten buyers with an openess in communication and it is important for me that both people people feel a good connection and can communicate. If adopting a kitten, you will to know you will feel confident talking to me concerning any matter at anytime in confidence. I am only a phone call, text or email away from you and will do my best to answer right away. Our philosophy of putting our cats first as family members, and 2nd as breeding cats is essential to keep us strong and all thriving. Every cat lives free and happy lives near us inside our home getting alot of attention. We live in the Swedish countryside and there is lots of room for them to really grow and thrive. Our fertile males never live outside permanently. They always have rooms inside our home to be near us and we visit them endlessly! As each cat and kitten is personally hand raised by us, it gives them adequate time, care and individualized attention they need (and we need with them!) to see our babies grow strong in their social skills with the very social and loving temperment that Norwegian cats are known to have. Being SVERAK certified breeders are considered as a quality assurance. As a registered breeder I agree to be updated with access and follow new decisions, rules and regulations and to actively work for the cat as a pet, and for good husbandry. After passing the exam, a SVERAK certified breeders have a basic cat and covenant knowledge to share with the cat buyers and prospective cat breeders. All breeders and members of SVERAK should - besides other laws and regulations - follow the FIFe and SVERAKs statutes and regulations. A SVERAK-certified breeder should also have shown that it has a basic cat and covenant knowledge to share with the cat buyers and prospective cat breeders. SVERAK-certified cat breeders, in addition to the cat itself, an important representative of reputable cattery, cat good posture and cat sport in general. Thus, there is a great responsibility towards the cat, SVERAK and SVERAKs values ​​and principles. SVERAK certified breeders should work positively in that spirit. I have taken The G1 and G2 exam in PAWPEDS's PawAcademy. G1 is the first class and G2 is the second class. There is also a third class which I will be taking shortly, when time permits. These class are training for breeders who want to learn more about diseases, breeding specifics and genetics. It is very important to keep learning and update ourselves as much as possible. You can click on each award to see the people who have passed the exam and I have Passed these 2 exams. We welcome you to contact us and hope you will enjoy visiting our site.